The Herkimer County Clerk's office has deeds on file dating from 1804, only a few years after the county was established, to the present, naturalization papers dating from 1821 to 1955, Federal and State census records for the county covering all the decades from 1820 to 1925, business incorporation records from 1814 to the present, and much more. The Clerk is located at 109 Mary Street in Suite 1111 in the town of Herkimer, NY, which is the county seat. 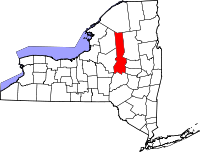 A large number of the many towns and villages within Herkimer County have their own historians who work on collecting and maintaining local historical and genealogical records and materials, and town clerks who are responsible for maintaining birth and death records for those births and deaths that occurred within their particular town. Birth and death records older than 75 and 50 years, respectively, are open to the public.